THIS ACCOUNT IS AN ACTUAL COPY OF THE OFFICIAL AMERICAN MOTORS HISTORY THAT I GOT IN 1957. On May 1, 1954, a new force appeared on America's industrial horizon. The newcomer was American Motors Corporation, created by the merger of two of the first families of the automotive and appliance businesses---Nash-Kelvinator Corporation and Hudson Motor Car Company. Through the consolidation, the company joined the select circle of America's one hundred industrial greats having an individual net worth of more than one hundred fifty million dollars. The two principals brought with them a record of having produced and sold nearly ten billions of dollars worth of merchandise during the past half century--over six million automobiles, more than ten million household appliances and commercial products--more than sixty-eight million automatic temperature controls, and a billion dollars worth of defense material. Directly concerned with the merger were more than 30,000 employees; 58,000 stockholders; and 10,000 American Motors dealers and distributors in more than 100 countries. An important new page was added to the record of American industrial progress. Since the end of World War II, industrial mergers have grown apace. It is estimated by Forture Magazine that 7,500 firms have merged since V-J Day. Some of these consolidations have been for diversification and integration of bussinesses; some for strengthening financial position and physical assets for a stronger market position; some, frankly, for survival. At the end of World War II the nation found itself at a high level of prosperity, with a tremendous pent-up demand for consumer goods-- especially for automobiles and household appliances. To get back into production of these products meant a vast program of buying new machinery and equipment, re-tooling, plant expansion and reorganization of personnel. Billions of dollars had to be invested by American industry in the coversion. As an example, in the two years immediately following V-J Day, Nash-Kelvinator and Hudson Motor Car Co. spent almost $40 millions for the purpose. With peace and the unleashing of pent-up consumer buying the inflation spiral skyrocketed. Millions of Americans had sizable hoards of savings which they were yearing to spend. George W. Mason, late president of American Motors Corporation, a hard-headed realist, held no illusions about the ultimate result of the publics buying spree. He clearly foresaw that one day it must end, that when output caught up with demand, the relationship between rising tooling costs and total units produced would be the most important factor in the competitive race. With that kind of manufacturing and marketing climate in prospect, to Mason it was elementary that enormous benefits could be accomplished by merging at least one other strong independent automobile manufacturer with Nash-Kelvinator. With increased capital, more physical assets, longer lines of credit, and concentrated production facilities, not only could the corporation build more cars at a lower unit cost,but many of these cost benefits would carry over into the company's appliance division. Mason started making overtures to several companies in 1946, but it was not until 1948 that one was sufficiently interested to listen to a proposition. Nothing materialized, however, possibly because the sellers' market still wore a healthy paunch--sales and earnings were far too good. By mid-1953, however, when the automobile industry entered a severe readjustment period, conditions were more conducive for merger. Officials of Hudson Motor Car Company sought out Mason to determine whether he was still interested in consolidation. On January 14, 1954, Hudson's board of directors, of which A. E. Barit was chairman, formally accepted a proposal made by Nash-Kelvinator. The details of the proposed merger were duly circulated among the stockholders of both companies, who voted overwhelmingly to approve the plan. The new American Motors Corporation officially began business on May 1, 1954. 1. Hudson's "Monobilt" construction was enough like Nash's "unitized" method, in which body and frame are one all-welded unit, that a changeover to one assembly line for two series of cars was much easier to bring about that it would have been with other makes. 2. Because of this basic design similarity, car production could be consolidated in the same plants, thereby effecting important economies. 3. Hudson dealers, with the Jet Series, were already active in the market for compact cars, thus were ideally qualified to sell the popular Ramblers. A merger of such large old-line companies as the principals of American Motors involves tremendous physical problems in consolidating personnel, plant facilities, sales organiza- tions, while continuing to produce. Mason had laid his plans so well that by October 1, 1954, the beginning of the first full fiscal year for American Motors, the consolidation was virtually complete. The new company found that its members were compatible, and that plans could proceed at full throttle. The new organization, whild retaining much of the character of each of its three basic sales divisions, nevertheless emerged with a brand new personality. As Mason put it, American Motors was "old in heritage, new in concept, combin- ing the tested experience of long service with the vigor and fire of youth." On October 8, the new organization received a tragic jolt. On the very day he was to fly to England and arrange further expansion of American Motors' foreign operations, George Mason died. 1. Set up a Policy Board of key executives from every division, with Romney as chairman. 2. Reorganized the corporate set-up. In addition to the Automotive Division, with separate Nash and Hudson sales organizations, three major autonomous divisions or profit centers were created: A. The Appliance Division B. Export and Subsidiaries Division C. Hudson Special Products Division, to handle defense work as well as making parts and equipment for the Automotive and Appliance Divisions. 3. Concentrated Hudson and Nash production in Wisconsin, and adopted the industry cost- cutting practice of spreading the heavy cost of basic tooling over more the one line of cars---four lines, in this case. As a result, in the first year alone, $15 millions were slashed from the cost tooling the two separate 1955 Nash and Hudson lines. The move makes American Motors the only independent enjoying this substantial manufacturing cost advantage. 4. Strengthened the Nash and Hudson dealer set-ups, which are being built up to 4,000 from about 3,000 dealers at the time of merger. Nash has dealers in 600 communities not served by Hudson, while Hudson dealers are located in 400 non-Nash areas. 5. Gave both Hudson and Nash dealers the popular Rambler series and the Metropolitan, thus widening the market and customer service coverage for these cars. 6. Accomplished the near-impossible by coming out in less than eight months with a competely new, restyled line of Wasp and Hornet cars, distinctly different in appearance from the Nash Statesman and Ambassador. 7. Broadened the export and foreign subsidiary operations for a more aggressive invasion of the growing Canadian and overseas markets. 8. Consolidated seventeen parts warehouses, effecting an estimated savings of about $2 millions annually. 9. Streamlined sales, administrative and purchasing departments, resulting in added operating economies. On December 27,1954, after one of the fastest major changeovers in the industry's history--just ten days-- six distinct series of American Motors cars were flowing from a single final assembly line. Even in an industry accustomed to quick and decisive action, it was an engineering production miracle ---completely effected in only 160 working days from the date of the merger! The company emerged a vastly strengthened industrial force--- with major gains in net worth, physical assets, lines of credit, manufacturing economy, organization strenght and marketing power. It is a Romney conviction that, with its new stature, American Motors is tagged for an increasingly important position in both the automotive and appliance industries. And it is his purpose that the company shall deliver fully on its slogan..."American Motors Means More for Americans." The most satisfactory way to show that Romney's dedicated purpose is realistic is to travel the road of the past into the present--and then relate it to the future. The following pages therefore present a pageant of the colorful history and important milestones of the companies that banded together to make up this new industrial entity. The history indicates the rich heritage-- going back for more than a century-- the impressive records of indutrial pioneering and high earnings that the principals brought with them, and the strong foundation of continuing progress on which corporation's future is being built. Actually, the Nash ancestral lines extend back will over a hundred years - to 1846, the year President Polk sent General Zachary Taylor to Texas to oust the Mexicans. In that same year the Seaman furniture factory was founded in Milwaukee. Later it was to become the Seaman Body Corporation, which built bodies for the original Rambler, and was eventually purchased outright by Nash Motors to become its body division. Strictly in terms of automotive background, however, Nash history properly starts with Thomas Jeffery's 1902 "horseless carriage", the one-cylinder Rambler runabout. 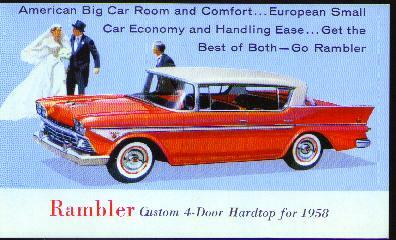 The Rambler become one of America's first mass-produced cars- 1500 were built the first year. Jeffery, and his son, Charles, progressed conservatively but steadily through a succession of improved models to his handsome 4-cylinder namesakes - the Jeffery touring cars and roadsters of 1914. The Jefferys' record of mechanical soundness and attractive contemporary styling won not only public favor but the interest of automotive pioneer and aggressive head of the growing General Motors Corporation, 52-year old Charles Nash. Nash learned that the Jeffery heirs were anxious to retire. He negotiated the outright purchase of the Jeffery Company. He resigned from the G.M. presidency, and in 1916 became the founder of what was to become Nash Motors. Nash continued to build cars under the Jeffery name for the remainder of 1916 and most of 1917, but in the fall of the latter year be brought the first cars out under his own name. The 1918 Nash, with a years-ahead six- cylinder engine, was the first all-new model under Nash's leadership. So great was Nash's personal prestige with the public, the car was an instant success. World War 1 by this time had involved the U.S., so Nash began to turn out mechanical workhorses for the A.E.F. -the famed four-wheel drive Quad trucks, of which the company built more than eleven thousand in 1919 alone, thus becoming the world's largest manufacturer of trucks. With peace, in November 1918, Nash purchased a half-interest in Seaman Body Corporation and thereafter restricted its operation to building bodies for Nash cars. In 1924, to acquire additional manufacturing facilities, Nash bought out two other automobile properties - the Mitchell Motor Car Company of Racine, and the LaFayette Motors, builders of the luxury, $5,000 "LaFayette". Because of its high price and limited market, the LaFayette line was dropped, and both plants were put to work producing Nash cars. It was from there facilities that the Ajax and the Nash Light Six of 1926, and the popular low- priced Nash-LaFayette of the Thirties were to emerge. And it was in there cars that now famous Nash beds were to make their first appearences. No happier circumstance could have occured for Nash Motors than the public's wide acceptance of the new low-cost LaFayette, for its introduction was shortly followed by the worst financial debacle in World history. By 1928, the first year of the Ambassador de luxe models, Nash production had reached nearly 140,000 units and was still rising in 1929 when the depression struck. With the nation's pocketbooks closing, and the pulse of business faltering, Nash retrenched-- as did every automaker, on passenger car production -- and stopped building trucks altogether. Fortunately, the company's finances had been astutely generalled, and it coninued to show profits through the first depression years. And even in 1932, 1933, and 1934, when losses, did appear, they were small compared to those of other companies. Nash stability is revealed in an FTC analysis of the period from 1927-1937. The Company's average return on investment was the second highest in the industy-- neck and neck with General Motors. In 1934, the 1,000,000th Nash rolled out of the company's Kenosha plant. As the company started its upturn in sales and profits, Charles Nash, the in his seventies, looked around for a man to take over the reins, and at the same time, a way to strengthen the company's capital structure and diversify its operations. In Detroit, he found the happy combination in George W. Mason and the Kelvinator Corporation, of which Mason was president. Negotiations led to merger, and the new company, Nash-Kelvinator Corporation, officially began business on Juauary 4,1937, with Mason as president, Nash as chairman of the board. With Kelvinator came a host of profitable subsidiaries: ReDisCo, an appliance financing enterprise; Kelvinator of Canada, Ltd.; Kelvinator,Ltd. of England; and Leonard Division and ice-refrigerator manufacturer Kelvinator had purchased earlier. Under Mason's management, Nash-Kelvinator advanced steadily. The merger proved to a fortuitous one for Nash Motors becaused the Kelvinator Division revitalized the company and was largely responsible for the company's strong comeback after the drepression. Mason promptly instigated long-range plans for Nash to enter the low-priced field with a smartly designed, light- weight car, aimed at large-volume sales. After four years of development and research, a car with "unitized" construction -i.e. body and frame welded together as one unit- was introduced. It eliminated a sub-frame, and shed 500 pounds of useless weight carried by previous models of the same proportions. Called the Nash "600" it was introduced in 1941, and was an instantaneous hit. Not the least of its attractions was the fact that the car achieved better than 25 miles to a gallon of gas at moderate speeds. Nash's sales climbed impressively, and the "600" undoubtedly would have gone on to make even more noteworthy gains had not World War II intervened. The last pre-war Nash moved over the assembly lines in February , 1942. Nash-Kelvinator Corporations's World Was II defense production record was outstanding. During a five-year span, N-K's 25,000 workers turned out 2,000-hp engines by the thousands for fighter planes; high precision hydromatic propellers for 18 types of warplanes; propeller governors by the hundreds of thousands; helicopters for reconnaissance and rescue work on land and sea; rocket motors and bomb fuses for the war on water; cargo trailers for an army on the march and high-powered binoculars. Nash automobile production was resumed in October 1945. Nash's smaller size and greater manufacturing flexibility, as compared with the Big Three, enabled the company to be one of the first two to come out with post-war cars. Each year after that the company's car output increased, settting new all-time records, with a peak of 178,827 cars in 1950. All along, Mason's philosophy was that Nash's clearest road to growth as an independent was to deliver something distinctly different from any thing competitors offered, thus creating its own market. Upon that concept, he instigated a long-range research program, studying changes in the automobile market caused by the growing traffic and parking problems, population increase, home-building boom and other factors. It led to the development of a car more compact that the "600" (which was renamed the Statesman in 1950). The new car with its 100-inch wheelbase, debuted in March, 1950, under the nostalgic name originated by Thomas Jeffery, The Rambler. The frist model was a convertible, followed three months later by a station wagon. A hardtop model bowed in early 1951. Later a four-door station wagon and sedan with 108-inch wheelbases were introduced. With their low smart lines, compactness, riding comfort, and welcome gasoline economy, the new Ramblers made an instant hit. Still seeking the Plus-X that he felt Nash cars must have to command increasing public interest, Mason, long impressed with the advanced styling of European autombiles, sought out the man recognized as the world's greatest car designer and custom- builder, Pinin Farina. Farina's crest could be found on de luxe motorcars he had built for members of royalty and hundreds of the world's social and financial luminaries. As a result of a meeting with Mason at the Paris Auto Show, Farina completely restyled the Nash line in collaboration with Nash's own design department. The 1952 models bore his distinctive design touches. Early in 1951, Mason made a deal with the Donald Healey Company of England to build bodies for and assemble a distinguished luxury sports car with a Nash Ambassador engine. Called the Nash-Healey, it was the first sports car introduced by an American manufacturer in two decades. Still questing in the realm of opportunity, Mason made another move. He was convinced there was a place in the American family for a small, economically operated car, and that the European design influence was going to spread. After testing every known make of foreign small car, Nash engineers turned out an experimental model, called the NXI (for Nash Experimental International) which was sent "on the road" around the country in 1950 and 1951. More that 250,000 people in all walks of life, were asked to fill out questionnaires giving their opinions on a score of items concerning the car. With this guidance for further development, Nash in 1953 announced it spirited continental-type automobile - the Metropolitan. Assembled in England, it featured a 4-cylinder Austin engine and body by Fisher-Ludlow. With a wheelbase of 85-inches, the Metropolitan had exceptional roadability. Built to Nash specifications, with Nash unitized construction, it offered up to 40 miles per gallon at moderate highway speeds. Launched as a small car "experiment" the Metropolitan found a ready market in congested East and West Coastal areas, particularly among multi-car families, and in Canada where the light, economy car has enjoyed favor. That is the Nash phase of American Motors story...highlighting only important milestones on the way to the merger of May 1, 1954. Thomas B. Jeffery, an expatriate British inventor, began making vehicles for human transportation in Chicago in 1879, when he started assembling parts of fine English-made bicycles and selling them under the name of Ideal and American. The imported two-wheeler soon became one of the country's fastest selling bicycles. When Jeffery invented the clincher bicycle tire, he revolutionized the business and sales spurted. At the Columbian Exposition in 1893, his now famous bicycle was displayed under a new name - Rambler. Two years later Jeffery and his mechanically inclined son, Charles, were to see their interest in bicycles wane. They were among the fascinated throng which witnessed the finish of the famed Times-Herald automobile race in Chicago in 1895. Charles started driving and testing all makes of gasoline buggies he could lay hands on, and finally developed one of his own. The Jefferys sold the bicycle business in 1899, and the next year Charles' mechanical marvel was shown at the International Exibition and Race in Chicago. The Jefferys bought a plant in Kenosha, for $65,000, to start building gasoline vehicles. They built two experimental models, called A and B, in 1901; two more labeled C and D in early 1902. The latter were exhibited on March 1 of that year at the automobile exposition in Chicago's Coliseum. They carried price tags of $750 and $825 respectively. The public reaction was good, so the Jefferys went into production, and called the cars Ramblers after their first love, the bicycle. In the first year 1500 were built. Four years after Thomas Jeffery died, in 1914, the Rambler was renamed the Jeffery, in tribute - and the Rambler was not to appear again on an automobile until 1950, when George W. Mason, president of Nash-Kelvinator brought out a Rambler series. In 1916, the Jeffery heirs accepted the offer of Charles W. Nash, who retired as president of General Motors and purchased the Jeffery Company. The latter had produced more than 57,000 cars in its 14 year history. A business which delivered its products, fine furniture, by oxcart and eventually became the world's largest manufacturer of early American telephone booths, wound up being American Motor's body division. It all started back in 1846, when Alonzo Duretto Seaman established a furnitured factory in Milwaukee. The business grew rapidly. After Seaman's death in 1868, his four sons took over management with the eldest, William D., as president. Under William Seaman, the company continued to prosper. In 1887, nine years after Alexander Graham Bell invented the telephone, Seaman had a bright idea. Why not make sound-proof telephone booths for use in public areas? Almost overnight, the Seaman Company became a thriving producer of fancy telephone cubicles, from which today's are not too dissimilar. The same year, 1906, that an earthquake and fire nearly leveled San Francisco, flaming disaster also struck the Seaman Company; its furniture plant was razed by fire. The company then leased a new, larger plant, allowing for expansion. Space was rented to a number of small businesses. One was the Petrel Motor Car Company. The proximity of a furniture manufacturer to an automobile company was a natural, since automobile bodies of those days were made mostly of wood. Petrel, in 1909, contracted with Seaman to manufacture its bodies. Foresighted William Seaman realized that this was a potentially tremendous business. He branched out and started making bodies by the thousands for such makes as Moline, Velie, Dorris, Columbia Taxicab, Kissel, F.A.L. and Nash Motors. Soon Seaman gave up Making telephone booths and switchboards and restricted all hs body-building to the Nash Company. 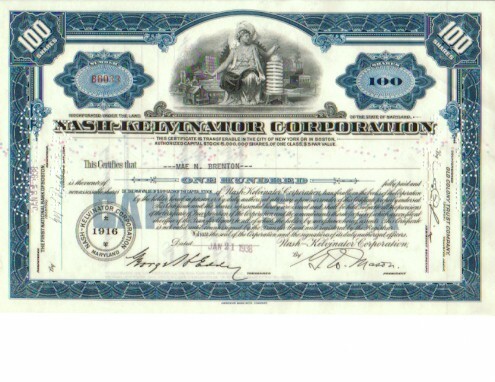 In 1919, Nash bought half interest in the company. On July 16, 1936, Nash bought the remainder of the stock, and the Seaman Body Corporation ceased to exist as such and became the Nash Body Division. The story of the Hudson Motor Car Company is one replete with automotive "first," many of which were adopted by other members of the industry; an impressive volume of production - more than three million cars built; outstanding defense activities on a grand scale; and scores of stock car racing records which emphasize Hudson's leadership in engine power development. The story began on February 24, 1909, when eight Detroit businessmen banded together to form a corporation to produce an automobile which would sell for less than $1,000. The eight visionaries were Roy D. Chapin, who organized the group, J.L. Hudson, famed department store magnate who gave permission for the company to be named after him, R.B. Jackson, Huch Chalmers, Harold E. Coffin, F.O. Bezner, J.J. Brady and Lee Counselman. The automobile they had all agreed there was a good marked for was called the Hudson "Twenty" was one of the first low-priced cars on the American market, selling for $900 f.o.b. Detroit. It boasted a sliding gear transmission, selective type, and a French Renault type vertical, four cylinder, water cooled motor. The company started production at a small two-story plant in Detroit, and first car was driven out of the factory on July 3, 1909. The partners had a better reason than most Americans to celebrate Independence Day, for the "Twenty", years ahead of its time in design, was a smashing success. More than 4,000 were sold the first year, the biggest first year's business in the history of the industry up to that time. Net sales for the first sixteen months were an impressive $3,980,999, which encouraged the company to buy a tract of land at Jefferson and Conner Avenues, five miles from the Detroit City Hall. There they built a new larger plant, with 172,000 square feet of floor space. Roy D. Chapin was elected president, succeeding J.L. Hudson. Shortly afterward, Chapin made an extended tour of European automobile factories. He was impressed with how far advanced they were over American companies is design and construction methods. Many of the observations he made during this junket were reflected in subsequent Hudson cars and plant operations. For example, Chapin became impressed with the superiorities of six-cylinder power plants he had seen in European plants. He induced Coffin and Hudson's engineers to develop a car with a six-cylinder engine to sell at a medium price. The first new Hudson with the stepped-up power was introduced in July 1912, and was followed by a roadster, the first low-priced car to 60 miles an hour. Chapin had also been impressed with the fact that, although European cars were made mostly of steel, they were lighter and stronger than American made automobiles with wooden bodies. He therfore had Hudson's designers and engineers create a car that was to create another sensation in the automobile world - the Six-Forty, the first six-cylinder car of moderate weight. It weighed less than 2,700 pounds, hundreds of pounds lighter than other sixes, and came equipped with a four-speed, over-drive transmission. This car had the dual advantage of greater speed, with lower gasoline consumption. In 1916--while a major war raged in Europe and a minor one sizzled in Mexico--Hudson introduced its Super-Six, which had the first fully balanced crankshaft, turned by an engine with stepped up power with compression ratio of 5 to 1, considered a great improvement at the time. This type or crankshaft was copied by other manufacturers and became universally used. Hudson's high compression efforts represented in the Super-Six also kicked off a power race that continued down the decades, and led to engines with compression ratios of up to 12.5 to 1. An idea of the significance of Hudson's increased compression ratio in the 1916 Super-Six is shown in the fact that it had a 76 h.p. output, against only 48 h.p. on the previous year's six-cylinder engine. A Hudson 1916 Super-Six demonstrated its tremendous power by zooming along at a 102 mph clip in the white sands of Daytona Beach. This was to the first of hundreds of performance exhibitions and races in which Hudson cars were to be entered in the decades following. The Super-Six's outstanding performance was largely responsible for Hudson selling 26,393 cars in 1916, a record up to that date, and for the expansion of factory floor space to 247,000 square feet. In 1917, Chapin brought about the creation Essex Motors, a subsidiary of Hudson, which was to produce the "dream car" that he had conceived in Europe, and which he felt would revolutionize the American automobile industry - the closed coach. Up to this time, the vast majority of American-made cars were of the open touring or runabout type, which were obviously restricted to fair weather use. Closed cars where priced $1,000 or more above open cars, which thus put them out of reach of the average car buyer. Hudson's engineers revamped their production methods to the point where they could bring out a closed coach selling at ony $100 more than the comparable open car. The Essex closed sedan and coupe were introduced in 1919 - and once again Hudson scored a sensation. Forty-one thousand were sold the first year. The closed automobile marked one of the most important milestones in automotive history - for it transformed the industry overnight from a a six-months' operation to a year-round affair. The Essex coach also boosted Hudson's sales tremendously, and by 1922, they were being sold in 50 foreigh countries. In that year, Essex Motors was dissolved as a separate corporation, and became part of the parent company. A year later, Chapin, satisfied that the company's affairs were running smoothly and anxious to devote most of his time to public affairs, particularly in his campaign for an improved highway system, resigned as president. He became U.S. Secretary of Commerce under President Coolidge. By 1926, Hudson was building all its bodies on a production basis in it own plants. Saaembly line methods, which Chapin had studied in Europe, were put into effect. The company celebrated its 20th anniversary in 1929, with a record of 1,779,360 cars built since it began business. The 1929 Hudson featured such innovations as an improved engine oiling system, with combination electric oil and gasoling gauge. Although the depression which began in 1929 retarded engineering advances in many industries, Hudson's engineers still kept at it. On July 21, 1932, Hudson introduced another famout name in automotive history - the Terraplane - which was christened by the popular aviatrix, Amelia Earhart. The unit-engineered method of construction introduced with the Terraplane is the key to Hudson's phenomenal record of 120 official American stock car awards for performance, endurance and economy between 1932 and 1940. The record of which the company was proudest was the all-time 24-hour mark, set by a Hudson Eight on October 10, 1936, at Bonneville Salt Flats. The Eight taveled 2,104 miles in 24 hours at an astonishing average of 87.68 miles an hour. In 1933, Chapin returned as president of Hudson which, like all automobile companies and most industrial firms, was beginning to experience heavy losses. During the next three years, through streamlining operations and refinancing, the company pulled out of its slump and was beginning to show profits again by early 1936, when Chapin died. A. E. Barit, who had been purchasing agent of the origianal Hudson Company, and treasurer of Essex Motors, and hadworked his way steadily up the line, was elected president. Under Barit, Hudson continued to develop styling and engineering improvements. The 1936 Hudson were equipped with patented double-safe Hydraulic brakes, and the automobile draft eliminator which equalized air pressure inside and outside the car. The '37 Husdson was the first American car to have the battery under the hood, rather than under the front seat. Auto-poise, front-wheel stabilization, airfoam seats and dash-locking hoods came in the 1939 Hudson, and Drive-Master automatic transmission was the 1942 contribution. Like other automobile companies, Hudson stopped making passenger cars in early 1942, and plunged all-out into war contracts. Immediately after V-J Day, Hudson prepared for the vast changeover back to automobile production and had cars moving out of its plants by October, 1945. The year 1947 marked the sale of the 3,000,000th Hudson. On September 19, 1947, the company ceased production on the 1947 models to prepare to build a completely re-designed car for the 1948 season, a retooling operation that cost $16 million. Hudson hailed the '48 as the "car you step down into", the first American-made automobile with a low silhouette, combining greater beauty, stability, "hug-the- road" ride and safety, with adequate interionr headroom and comfort. Hudson cars since then have retained this low silhouette, now common in the industry, while its engines kept being improved and the line rounded out, until it had a range of seven powers. The company expanded its operations on the international front, purchasing plants in Canada and England, and establishing sales and service facilities in more than 100 countries. The selling and service organization was gradually built up to a network of 3,000 world wide outlets. In 1951, the company outdid its previous efforts as far as engine power was concerned, with a 145 h.p., six-cylinder engine in the new Hornet. Hornets have won scores of racing car victories since then. In 1951, Hudson also re-entered defense production. Contracts to manufacture the Wright R-3350 engine, fuselage sections of the twin-jet B-57 Canberra Night Intruder bomber and fuselage sections of the B-47 bomber were assigned to Hudson. Conditions within the automobile industry in late 1953 made A. E. Barit and Hudson's board of directors realize that if the company were to continue to make notable contributions to the automobile field, its position had to be strengthened. Accordingly, they were the mood to listen to and accept George W. Mason's suggestion that Hudson merge with the Nash-Kelvinator Corporation, for the mutual benefit of both.